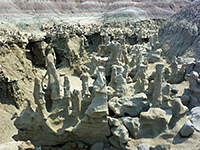 The generally dull, dusty, rather featureless land of the Uinta Basin in northeast Utah is the unlikely setting for one of the most unusual, small-scale erosional landscapes in the Southwest, known for several decades as Fantasy Canyon following its discovery in 1909 by paleontologist Earl Douglass. Most of the surroundings consist of sagebrush flats and low, rounded hills, mixed with scattered patches of muted pastel badlands and small rocky outcrops, but in this location the sandstone has formed an amazingly complex, intricate and delicate array of shapes. 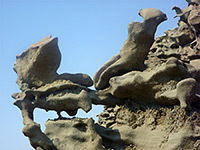 The main erosional direction is horizontal; much of the area resembles piles of irregularly stacked planks, or bones, but the rock also erodes along vertical joints to form very thin pinnacles. 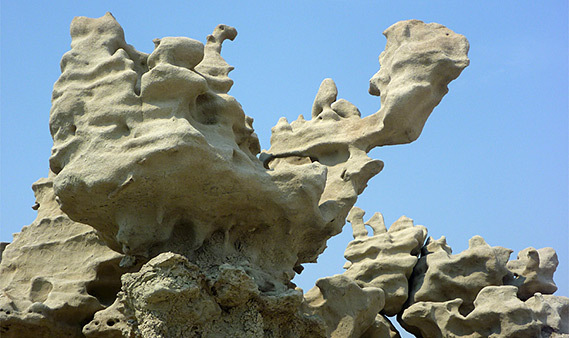 This combination has created innumerable weird forms including many narrow structures extending both upwards and outwards from the bedrock, some of which have received semi-official names. Also present, though less common, are fossilized shells and thin bands of magnetite, a shiny black mineral. The colors of the sandstone, however, are not so exciting - mostly grey or light brown, and even though they are noticeably richer around sunrise and sunset, the place is not as photogenic as some similar red rock landscapes elsewhere in the Southwest such as Little Finland in Nevada. Fantasy Canyon is signed from Highway 45 south of Vernal - the route is along a side road, initially paved, and busy all day with big trucks and other vehicles from extensive oil and gas operations in the area. A left turn after 12.7 miles is followed by five more junctions, all signposted, now along unpaved but still good quality tracks, though they may be impassable after heavy rain. 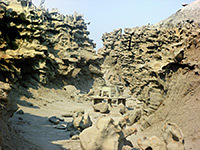 Dozens of little turn-offs lead to drill sites, and the surroundings remain generally unpromising; the only exposed rocks are isolated groups of irregular boulders, not at all interesting. 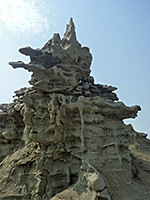 The last section of the route ends at an earthen parking area with BLM sign, register and information board; the formations of Fantasy Canyon start 200 feet south. Primitive camping is permitted at the trailhead, this being a little pocket of public land surrounded by the oil and gas fields. 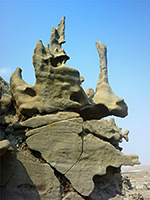 The formations occur on the north side of a low mesa, and are centered on a narrow ravine about 200 feet long and 20 feet deep at the upper end, extending a little way north and west, where the eroded rocks become more isolated. A half mile trail winds through the area, marked with stones and signs, and visitors are encouraged not to stray from the path in order to avoid damaging the formations. Cross-country travel is allowed a little way southwest, where the rocks give way to rolling hills, shallow washes and scattered hoodoos. Notices are placed beside about 40 named features, with the precise distance across and up, but in some ways it seems best to find one's own. An octagonal bench has been installed in the middle of the ravine, which certainly provides a good place to rest, but spoils the natural appearance. It only takes half an hour or so for a quick walk viewing all the formations, but the site is well worth the journey, and if waiting for optimum light conditions and taking photos from different angles, then many hours could be spent here. Above the rocks are undulating, clayish badlands, a little more colorful, with pale bands of pink, blue and orange.